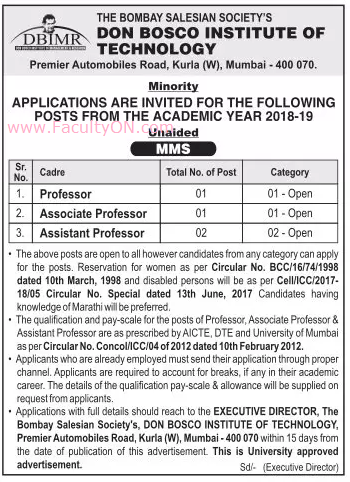 Don Bosco Institute of Technology, Mumbai has advertised in the LOKSATTA newspaper for recruitment of Teaching Faculty- Professor / Associate Professor / Assistant Professor jobs vacancies. Interested and eligible job aspirants are requested to apply within 15 days from 20th September 2018. Check out further more details below. About College: The Don Bosco Institute of Technology is managed by the Bombay Salesian Society. The Bombay Salesian Society is a registered charitable trust that manages various charitable and educational activities in the state of Maharashtra. Its educational institutions are usually named after Don Bosco who is the founder of the Salesians who are Roman Catholic Priests and Brothers. How to Apply: Interested and eligible candidates are requested to send applications with full details along with copies of certificates and PP size photos to the postal address given below.